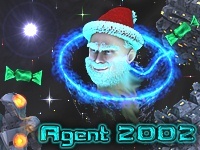 Agent 2002 is a significant arcade game with splendid animation and music. In this fascinating adventure you are the android with codename: Agent 2002, you must bring up presents to mazes of deep space. You face malicious cyber-guards with their skilful traps and only a tiny remote device and various bonuses may help you in this hard mission. The game is filled with impressive special effects and lovely bonuses. State-of-the-art design, splendid graphics and miraculous music immerse you into the unforgettable virtual world. Cool Anti-Pac-Man game! Lovely music and graphic! Run it! I'll give it a 5 only because I assume it's useful. I clicked here hoping it was a new version of Forte's Agent newsreader...talk about a program needing an update! some audio formats are still not supported, the only new thing is the recommendations folder...and the most hated feature is the 128kbps limit...i mean other file-sharing software can d/l mp3s of much better quality, y can't kazaa?